BBC NEWS | Middle East | Bowen diary: Is this the end? Bowen diary: Is this the end? BBC Middle East Editor Jeremy Bowen is writing a diary of the conflict between Hamas and Israel. Is this going to be the war's last day? The Israelis are saying that it might be. At the end of the Jewish Sabbath, after the sun goes down tonight, Israel's security cabinet is going to meet. The prime minister's spokesman, Mark Regev, told me late last night that they had what they needed for a ceasefire. He expects the proposal to be put to a vote, and he expects it to pass. What does Israel think it has? First of all the deal with the Americans about a joint effort to stop arms smuggling into Gaza to rearm Hamas. The memorandum of understanding is most important as a political symbol. It allows Israel to say that one of its main ceasefire demands has been satisfied. Add that to the army's conviction that it has done serious harm to Hamas, and they can tell themselves they have a convincing basis on which to declare victory. Israel doesn't want to bestow any legitimacy on Hamas by making an agreement with it. But to me that smacks of spin control. The reality is that Hamas is part of the Palestinian landscape. It has played a full part in the ceasefire talks that have been mediated by Egypt. Cairo has passed on the views of Hamas to Israel. When this is over, and when Israeli troops pull out, Hamas will still be in charge in the Gaza Strip. Hamas has its own demands for a ceasefire. It wants Israeli troops out within a week and the end of the Israeli blockade of Gaza which destroyed the economy long before the war started. I just broke off writing for a couple of minutes to take a call from Chris Gunness, who is the spokesman for Unrwa, the UN agency that looks after Palestinian refugees. He was ringing to say that Unrwa wanted an investigation into whether Israel has committed war crimes in the Gaza Strip. Civilians are protected by the laws of war. I have known Chris for years, as he used to be a BBC foreign correspondent. He wanted to make sure that we knew he was using the phrase for the first time. He said that the attack this morning on a UN school in Gaza looked as if it was a war crime. He told me: "When you have a situation where you have a direct hit on a UN school where around 1600 people have taken refuge and two people have been killed, there has to be an investigation to determine whether a war crime has been committed." And he added that "there has to be accountability, accountability, accountability." 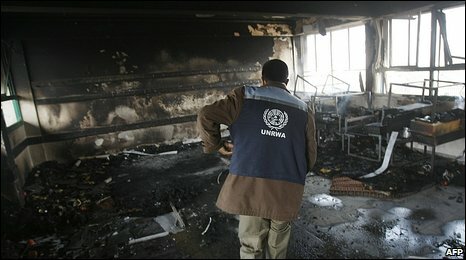 He said that Unrwa had been keeping a catalogue of attacks that could be war crimes. Their record amounts to hundreds of emails recording in real time what has been happening. One more thing: when this misery ends both sides will say that they won.